Twenty seven year old Andrea Williamson recounts the night twenty years ago, when she thought she was visited by an angel, and the terrible dream and repercussions that followed. At the age of eighteen, Andrea joins The Celestial Exchange Agency, but not all is what it seems, and the consequences of her time with them shatters a friendship. At twenty seven, Andrea finds love and learns about the colors of Magic. But as she's trained, she begins to feel uneasy about her lover's spirit guide. 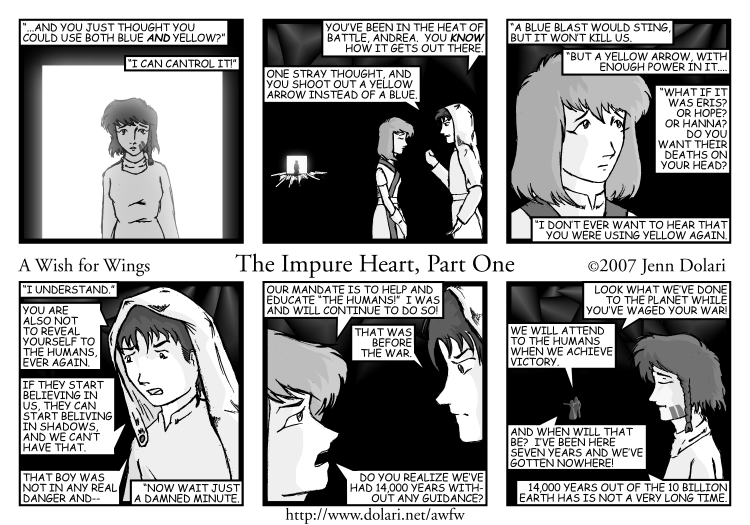 Andrea is hunted by one of the shadows, is told how Hanna became an angel, and we learn about the creation of Abbadon. A Shadow Ogre threatens a funeral, and Andrea is sent to observe the fight, and learns firsthand the dangers of Shadow hunting. Andrea's mother has a talk with her about the afterlife. The Archangel Michael broods over his past, and why love is a terrible thing in war.